Research resources for the study of women in Islam; Islam and its ideology dealing with women, Muslim feminism, dress code, family and marriage, women and gender in Islam, etc. ﻿ There are all sorts of items of dress which are worn by Muslim women, and these vary all over the world. Sharia (Islamic law) does not require women to wear a burqa (Arab. 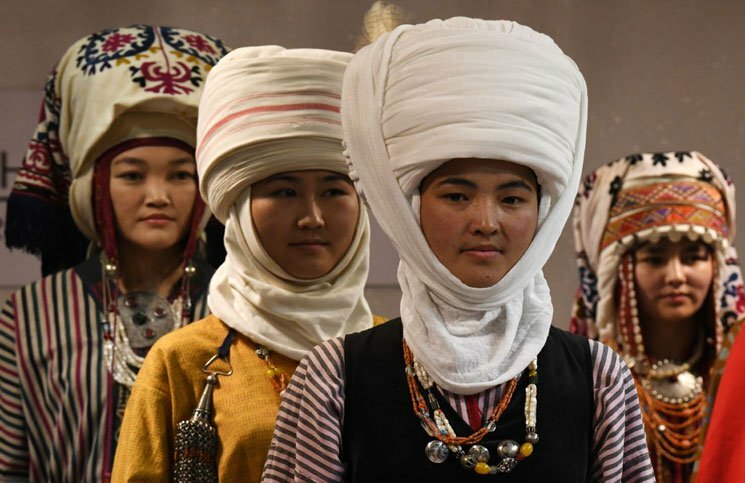 : بُرقع‎ ; Persian: پرده ;Urdu: also known as chadri or paranja in Central Asia; transliterated burkha, bourkha, burka or burqu') is an enveloping outer garment worn by women in some Islamic traditions to cover their bodies when in public. Burqas belong to particular areas of the world, where they are considered normal dress. In other parts of the world the dress is totally different. 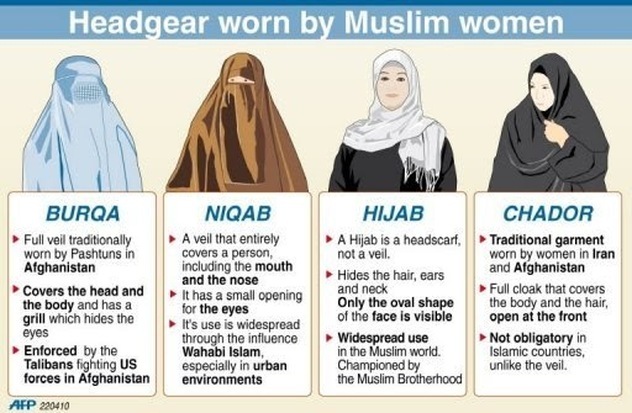 The rule of dress for women is modesty; the word hijab (حجاب) means "cover," "screen," or "curtain,"and refers to both a specific form of veil worn by some Muslim women and the modest Islamic style of dress in general. 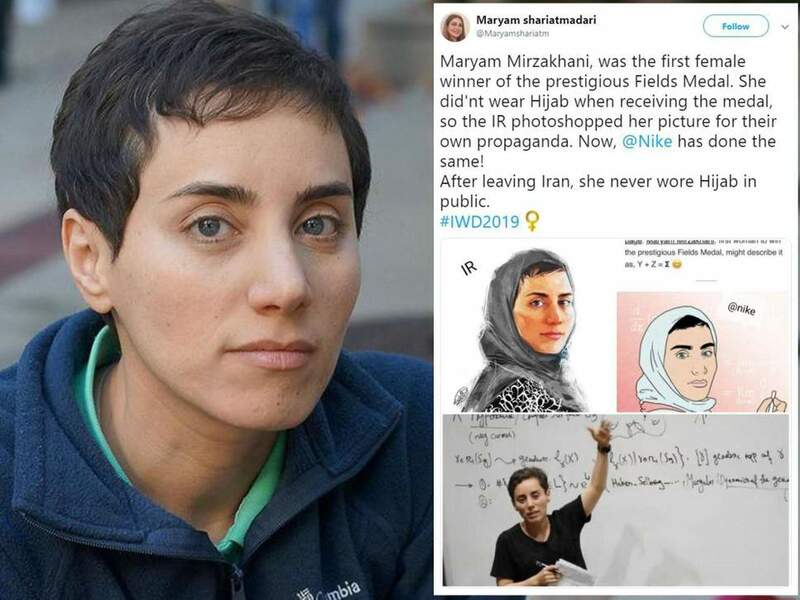 Muslim women are required to observe the hijab in front of any man they could theoretically marry. This means that hijab is not obligatory in front of the father, brothers, grandfathers, uncles or young children. Hijab does not need to be worn in front of other Muslim women, but there is debate about what can be revealed to non-Muslim women). Modesty rules are open to a wide range of interpretations. Some Muslim women wear full-body garments that only expose the eyes, although there is no Quranic text requiring this extreme. Some cover every part of the body except their face and hands. Some believe only their hair or their cleavage is compulsory to hide, and others do not observe any special dress rules. * Muslim Women's Clothing (Adapted from The Seattle Times, May 27, 2003) MS Word doc. How people in Muslim countries prefer women to dress [ .pewresearch.org, 1/2014 ]. 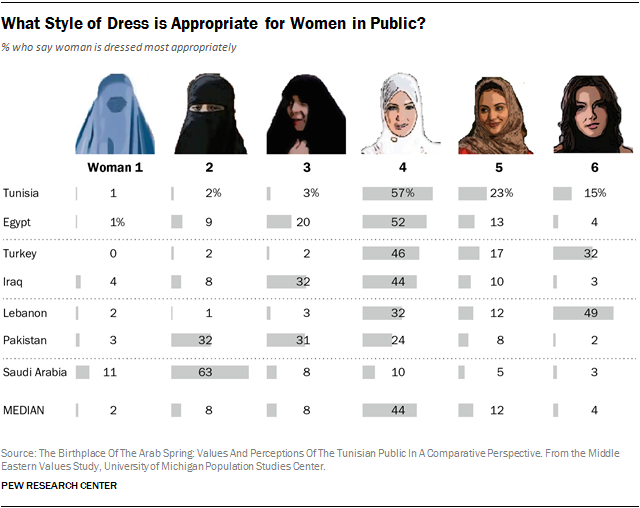 Preferred dress for women in Muslim countries [The data was gathered as a part of the "Middle Eastern Values Study" conducted by the Michigan Population Studies Center. Q&A with author of the U. Michigan study. University of Michigan’s Institute for Social Research. 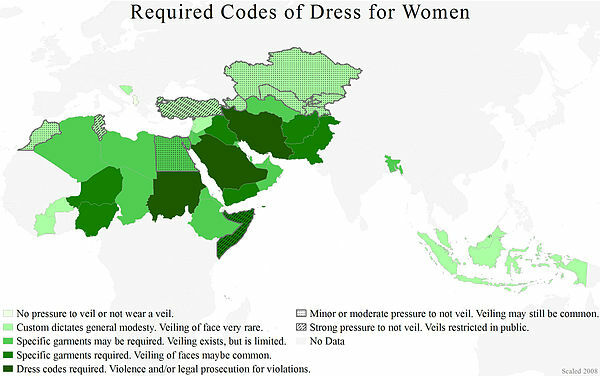 Survey on preferred dress for women in Muslim countries. Freedom, Norms, and the Ban of the Muslim Veil in France 1830-Present / By Hilary Black. The French islamic headscarf Bill in a perspective of sociology of Law / Claire De Galembert, ISP - Institut des Sciences sociales du Politique. Brent Luvaas, “Shooting Street Style in Indonesia: A Photo Essay.” Clothing Cultures 1, no. 1 (2014): 59-81. Annelies Moors, “NiqaBitch and Princess Hijab: Niqab Activism, Satire, and Street Art.” Feminist Review 98, Islam in Europe (2011): 128-35. What the hijab means to me: From Nigeria to Uruguay, women share their thoughts and feelings about the hijab. [aljazeera.com/ 29 Nov 2016]. Nondomination or Practices of Freedom? 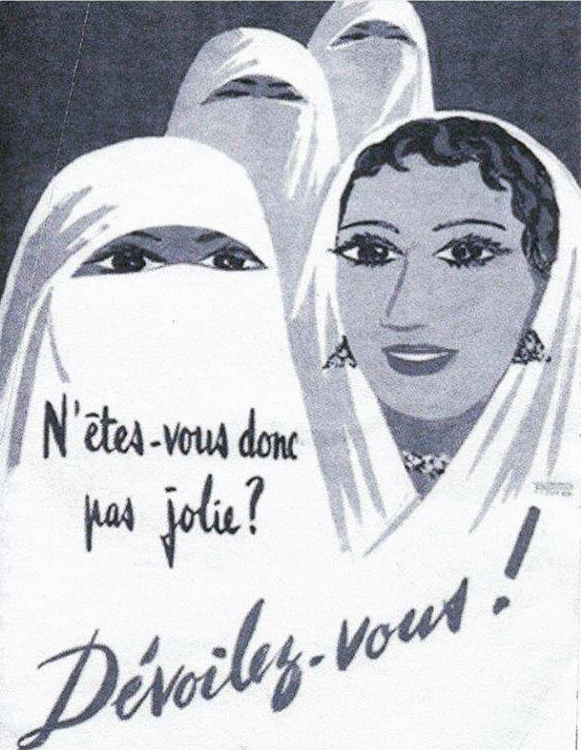 French Muslim Women, Foucault, and the Full Veil Ban / INES VALDEZ, Ohio State University. [American Political Science Review. Vol. 110, No. 1 February 2016]. Anadolu kadın başlıkları by Nevin Balta. Publication Date: Turkey : Alter Yayınları, 2014. The Quran says that Muslim men – not women – should be the first to observe hijab / QASIM RASHID [30 March 2017] The Independent, U.K.
As Muslim women, we ask you not to wear the hijab in the name of interfaith solidarity The authors argue that the Koran does not require women to wear a hijab, but that they are being bullied into covering themselves by conservative Shiite and Sunni sects. By Asra Q. Nomani and Hala Arafa washingtonpost.com @December 21, 2015 . Seljuk and Ottoman Women: Women and the Arts; Clothing Styles. Turkish women unveiled [2006?] Video 1 videodisc (52 min.) New York, NY : Women Make Movies, [2006?] In English and Turkish with English subtitles "In this thought-provoking documentary, veiled and unveiled women explore relationships between Islam and secularism in present-day Turkey, where millions of women, many of them educated and urban, wear the headscarf or hijab."--Container. Gamal Abdel-Nasser Recalling a 1953 Conversation on Hijab with Muslim Brotherhood Ikhwan's General Guide. Joan Wallach Scott on The Politics of the Veil + a series of short symposium interviews of experts, Bowen included, about the French headscarf affairs: [ http://www.youtube.com/watch?v=YHsD5__5wuM&feature=related ] [ http://conversations.berkeley.edu/content/joan-wallach-scott].